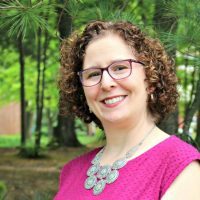 This meal was a particular triumph for me–with my new tight grocery budget, we got to last Saturday night with a relatively empty fridge, and my husband and kids wanted to eat out. With fish in the freezer and a half-bag of slaw in the produce drawer, I came up with this Almond Tilapia and Broccoli Slaw meal. They loved the flavors, and I loved the crunchy texture on the fish that I’ve missed since I started cooking gluten-free and avoiding breadcrumbs. Melt the butter with the olive oil in a large saute pan. In a shallow dish, mix the flour and almonds. Rinse the fish and pat dry, then coat with the dry mixture. When the pan is adequately hot (it needs to be for the coating to get crispy and not soggy), place the fish in the pan. Cook 4-5 minutes on each side. For the slaw, whisk the dressing in a small bowl. I use a little sesame oil with the regular canola; it's expensive so I don't fill the whole 1/4 cup, maybe just a third. Add to the broccoli slaw and toss to coat. Pile the slaw on a plate and top with fish fillet. My family prefers the broccoli slaw to regular cole slaw since it has broccoli and carrots along with the cabbage, and the texture is so crunchy. I also prefer the vinegar dressing to anything with mayo. My kids love broccoli slaw, and we often serve it with my Pulled Pork Sandwiches or grilled hamburgers since it’s light and vinegar-y, plus a nice change from a regular green salad. 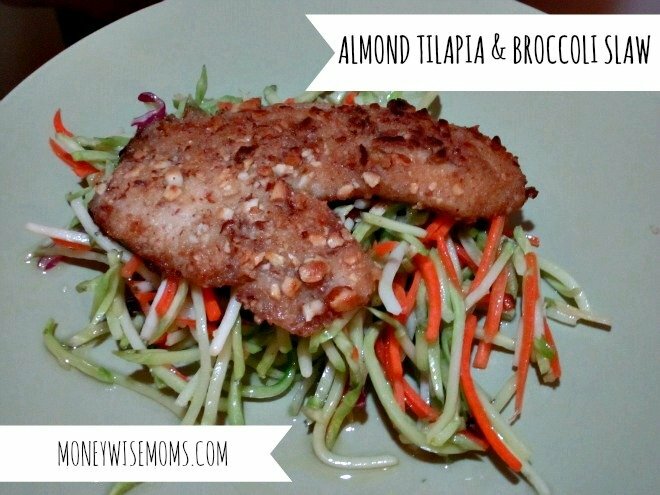 This Almond Tilapia & Broccoli Slaw recipe is linked to Tasty Tuesdays at Balancing Beauty & Bedlam and Gluten-Free Wednesdays at Gluten-Free Homemaker. This was super simple and everyone ate it! Even my 2 & 4 year olds who never touch fish! My daughter even asked if she could have fish for breakfast tomorrow. I love that the ingredients are relatively healthy and other than the broccoli slaw that I had because it was on sale this week, all were items that I usually have in my cupboards. This recipe will definitely go into our regular rotation.